Better policy integration and cooperation will be needed for Canada, Mexico, and the US to fully realize the North American energy renaissance’s potential, Alberta Premier Jim Prentice said. Unfortunately, trends are leading more toward fragmentation and confrontation, he warned. As Canada’s environment minister, Prentice said he worked closely with the Obama administration on automotive efficiency standards that have contributed significantly to greenhouse gas emissions on both sides of the border. Prentice said that strengthening North American energy principles, establishing the continent as a global environmental performance leader, and developing safer and more modern energy transmission systems should be the primary goals in all three countries. After nearly a century of dwindling crude oil supplies and increasing imports, US government decision-makers soon will be able to dispense with having to do business with regimes which fundamentally oppose this country’s interests and values, Prentice said. Beyond US oil production’s growth, Canada’s emergence as the largest foreign oil supplier to the US is by no means one-sided, with more than 1,900 US companies working in the oil sands value chain, he said. Lower natural gas prices have generated substantial industrial and manufacturing growth on both sides of the border, Prentice said. “We are now opening up a tremendous advantage, but it will have to be shored up by building more infrastructure in both countries,” he said. Prentice said he has visited Enbridge Pipeline’s LLC’s recently completed Flanagan South crude oil pipeline, a nearly 593-mile, 36-in. interstate system which originates in Pontiac, Ill., and terminates in Cushing, Okla. It has an initial 585,000 b/d capacity, with an ultimate 880,000 b/d design capacity after pumping station enhancements, according to the Enbridge Inc. division. Flanagan South was simply the latest of several crude pipelines Canadian companies have built to move Alberta’s heavy crude to US Gulf Coast and Midcontinent refineries without significant opposition, Alberta’s premier said. 1. Natural gas chiefly consists of methane (CH4), but also contains other hydrocarbons such as ethane, butane, propane and naphtha. 2. Natural gas is odourless, colourless and flammable. It is non-toxic and lighter than air; utility companies add the smell of rotten eggs – a product called mercaptan – to make leaks easier to detect. 3. Natural gas is thought to have been first discovered in the Middle East between 6000 and 2000 BC when lightning strikes ignited natural gas seeping from the ground. 4. The first pipelines were built in China in 500 BC. The lines, made out of bamboo, moved gas which was used to make evaporated salt brine. 5. Naturally occurring natural gas was found in the USA in 1626, when French explorers discovered Native Americans igniting gases that were seeping into and around Lake Erie. 6. Rembrandt Peale, a famous portrait painter, founded the first natural gas utility in Baltimore, USA, in 1816 after using natural gas as an energy source to light an exhibit at his museum and gallery. 7. The American industry really took off in 1859, when former rail conductor Colonel Edwin dug the first well and found oil and natural gas 69 feet below the earth’s surface. 8. Natural gas comes in two forms – dry or wet. Dry natural gas is what is commonly referred to by the media and is used in heating and cooling systems, and for electrical power generation. Dry natural gas is almost completely methane (the higher the methane concentration within the gas, the drier it is). In comparison wet natural gas contains less than 85% methane and has a higher percentage of liquid natural gasses such as ethane and butane. 9. Liquefied natural gas (LNG) is made when natural gas is cooled to temperature of minus 260 Fahrenheit (-162 Celsius). When it becomes liquid its volume is reduced 615 times, which can be done by cooling the gas. 10. There are over 11 million road vehicles worldwide that run on natural gas as a fuel. The gas is used in a compressed or liquefied state to power cars, buses, taxis, and trucks. 11. Natural gas isn’t just used for heating and cooking. Numerous every day products wouldn’t be possible without it! From vinyl flooring, carpeting, and piping to Aspirin, artificial limbs and heart valves to sun glasses, deodorant and cell phones. 12. Natural gas produces less than half the CO2 emissions of coal when burned and far fewer other particulates and emissions. When burned to heat homes or for industrial uses, it releases 25-30% less CO2 than oil and 40-50% less than coal per unit of energy produced. 13. Natural gas has had a tremendous growth as part of the global energy mix, and today accounts for 21% of global primary fuel consumed. Current reserves are enough to support global conventional gas consumption for the next 60 years. 14. The International Energy Agency (IEA) suggests that unconventional oil and gas could account for as much as 50% of undiscovered global reserves. 15. China has the largest expected recoverable shale gas resources in the world, with almost double the resources of the United States. Argentina has the second. 16. And finally… every hour on the hour in the evenings, a volcano erupts in front of the MGM Mirage Hotel in Las Vegas. It’s fuelled by Pina colada-scented natural gas. Natural gas as a transport fuel is not a new story. With over 14.8 million natural gas vehicles (NGVs) on the roads worldwide, the industry is well-established, challenging perceptions about how all forms of transport are powered. In addition to increased supplies – thanks to the US shale revolution – the change towards gas has been further incentivised by regulatory, economic and environmental imperatives. 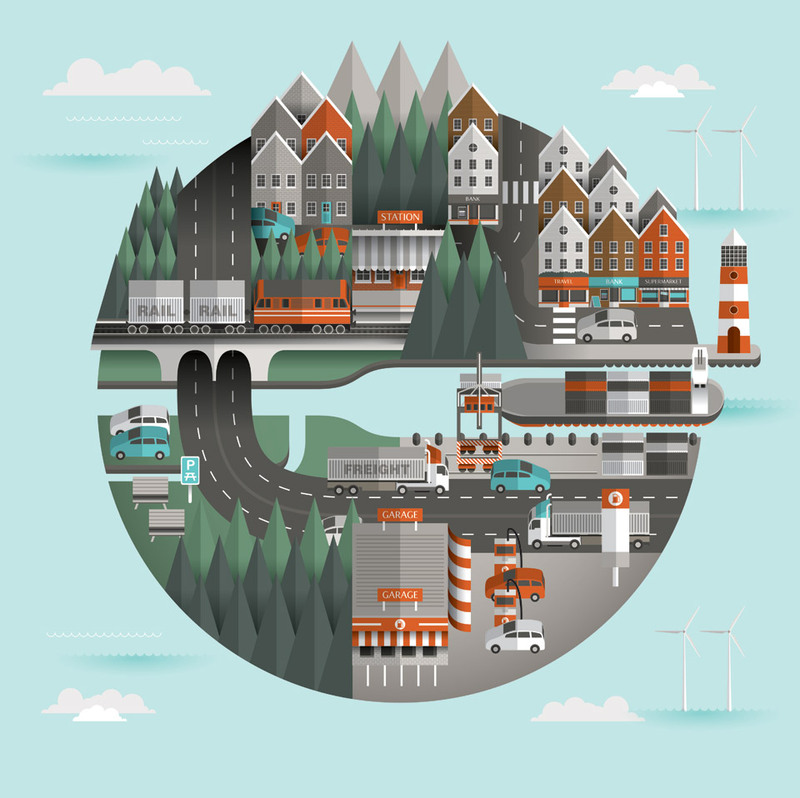 Road transport alone is currently responsible for 20 percent of CO2 emitted by the European Union; replacing petrol and diesel with natural gas is widely agreed to be the most effective route to both lowering fuel costs and improving emissions performance. And the success of NGVs on the road has blazed the trail for rail and marine – we explore the future of a cleaner, more efficient means of powering our transportation globally. There are over 14.8 million natural gas vehicles (NGVs) on the roads worldwide, and thanks to the environmental and cost saving benefits that number is set to rise rapidly – to as much as 25 million by 2019. The increasing number of cars on the road, combined with extensive innovations in NGV engines, means natural gas is a highly competitive industry. China is leading the way with 1.6 million NGVs currently, but the US is fast catching up thanks to growing investor confidence and cheap gas reserves. Although adoption of NGVs is slower in Europe, Italy is leading the way with almost a million NGVs on the road, and other markets such as Italy and Germany are introducing tax incentives and regulations to encourage their growth. The economic and environmental advantages of natural gas are particularly acute for Heavy Goods Vehicles. As a result there is a significant global truck market opportunity where the adoption rate in the leading markets of China, India and Europe is moving faster than the gasoline to diesel. A truck travelling on natural gas can travel on £0.39 per mile, which is a saving of 37% on diesel. By switching to natural gas each truck could save over £16,000 per year on fuel. Taking diesel powered trucks off the roads has the dual-advantage of reducing NOx and other harmful particulates being emitted into the atmosphere. With car ownership and road freight set to rise, combined with extensive innovations in NGV engines, natural gas as a road transport fuel is becoming highly competitive. The economic and environmental advantages are particularly acute for Heavy Goods Vehicles (HGVs), making them attractive to both individual operators and fleet businesses alike. China is leading the way with 1.6 million NGVs currently on the roads, predicted to rise to 5 million by 2020, but thanks to growing investor confidence and cheap gas reserves, the US is fast catching up. The International Energy Agency (IEA) predicts that together these two giants will account for the majority of gas consumption in transport by 2035. By comparison the European market is slower to adapt, with only 10 percent of global NGVs. Yet here too change is taking place; Italy appears an early front runner, with Germany ambitious to catch-up. Several other European nations have also announced the introduction of tax incentives and regulations to encourage the growth of NGVs. The railway system is one of the most fuel consuming forms of transport; in 2012 alone the seven major US freight railroads collectively consumed more than 3.6 billion gallons of diesel, accounting for 7% of US consumption for the fuel that year. So the benefits to be gained for converting to gas are huge. Liquefied Natural Gas (LNG) boasts cost savings of between 40% and 60% for rail, and although the start-up capital is high, overall cost saving is expected to be $200,000 each year across the typical 30 year lifespan of a train. Due to the potential savings and environmental benefits that come with using LNG it is thought that in the US alone 35% of freight rail energy consumption will be powered by LNG by 2040. American company Class 1 railroads spent a staggering $9 billion on diesel fuel in 2012, so the appeal of cheaper, cleaner natural gas is clear. The preferred rail solution is fast becoming Liquefied Natural Gas (LNG), which boasts cost savings of between 40 percent and 60 percent. GE and Electro-Motive Diesel are currently collaborating with different railway operators to develop LNG-Diesel engines and running pilot programmes across North America. Although high capital investment costs are required to retrofit an LNG engine to a train, the overall cost saving is expected to be $200,000 each year across the typical 30 year lifespan of a locomotive. An added benefit is the need to refuel less frequently – an LNG powered train can run between Los Angeles and Chicago without stopping to refuel. Many predict that gas powered ships could achieve the greatest market penetration of all natural gas vehicles (NGVs), particularly in light of regulations limiting emissions from shipping. Whilst costs vary, the cost of Liquefied Natural Gas (LNG) is often less than half that of Heavy Fuel Oil which is currently used in most ships, and forecast to drop in the future, making it even cheaper for marine vehicles. When compared to oil LNG is far better for the environment, with 25% less CO2, 90% less NOX, 100% less SO2 and 100% less soot and other harmful particles. LNG also has significant safety benefits over oil; it is much less flammable, and in over 40 years there has never been a notable safety concern or issue. Although the number of gas powered ships is much lower in comparison to road vehicles; this is not to say gas does not have a significant role to play. Marine vessels have much lower turnover and both the economic and environmental factors mean many predict that gas powered ships could achieve the greatest market penetration. This is particularly true in light of International Maritime Organisation regulations that ensure that both industry and governments limit the amount of emissions from shipping over the next decade. In Europe natural gas fuelled ships are already being built and operated in national waters (mainly for transport and commercial use). Norway has long been a front runner, and Statoil uses gas powered boats to transport goods and equipment to offshore installations where the gas originally is first extracted from the ocean floor. Gas is also being used to power longer ocean voyages: LNG is unsurprisingly used to power LNG tankers and now shipping owners are exploring the possibility of using gas to power huge container ships around the globe. The step-change from diesel to gas does not require a huge engineering leap as there is a healthy market of marine vessels being retrofitted with gas powered engines. Retro-fitting or building new gas powered marine vessels can also help to stimulate the global ship manufacturing industry. In summary, natural gas as an alternative transport fuel works and is here to stay. The environmental and economic benefits, combined with market forces, are creating a new chapter in manufacturing and transport. Source: "Natural Gas Vehicles: The Future Of Transport." Forbes. Forbes Magazine, 12 Jan. 15. Web. 27 Feb. 2015. <http://www.forbes.com/sites/statoil/2015/01/12/natural-gas-vehicles-the-future-of-transport-infographic/>.